Your family has now been in summer vacation mode for at least a week or two. For your kids, this probably is their favorite time of the year! For you, however, summer break can be stressful and full of decisions about how each day will look. You feel a little guilty, but wonder how you will survive summer vacation with your kids. Summertime activities are not consistent from day to day. This often causes you to feel as though it is impossible to create anything close to a schedule throughout the summer. However, consistency can be a very important factor in maintaining positive behavior. When you and your kids are able to predict certain parts of the day, it will be easier to transition from one activity to the next. As helpful as it is for you to schedule stimulating activities for your kids, it is just as important to schedule down time as well. Kids need time to relax and to be on their own, just as much as you do. Encourage your kids to entertain themselves, be creative, and use their imagination! 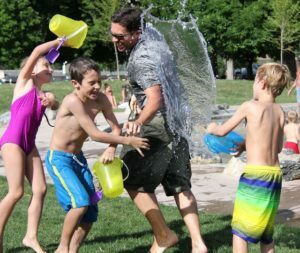 Kids still need to have responsibilities throughout the summer. It can be easy to fall out of the routine of chores and other responsibilities, but allowing this to happen will make it even more difficult to return to tasks and homework as the new school year begins. And, you certainly won’t feel like you can survive summer vacation with your kids if you are waiting on them all day! Adding chores to the routine can help your children learn that responsibilities are continuous, regardless of school activities. Don’t Just Survive Summer Vacation With Your Kids. Have Fun! Summer is a great time to create memories with your family. Maintaining a schedule is important, but so is unstructured down time. Live in the moment, create new routines and have fun with each other. Often, summer memories are the memories that everyone will remember the most! Summer vacation can be a good time to start family counseling or individual counseling for your teen or tween. Jamie Smith, LMFT, can help! Contact Jamie today to schedule an appointment.